It’s true. Beauty really is in the eye of the beholder. Saturday afternoon I headed into our neighborhood ready to put away groceries and relax after work. Half a block from our house, I had to pull over for a free sign and I almost got teary looking at what I saw. I raced around the corner to get home asap and as I was getting out of the car, John came outside with the kids to help with groceries. I told him to skip the groceries and just head down the street to check out the treasure I found. But I didn’t care. We all headed back down, one raggamuffin kids in a diaper and tee, the other in a backwards dress with crazy just-after-nap hair and dirty flip flops thrown on her feet. It’s so pretty. SO pretty. He just shook his head and asked if their teenage son would help him get it to our garage with him. They brought it back and I ran my hand over the wood across the back of the couch. 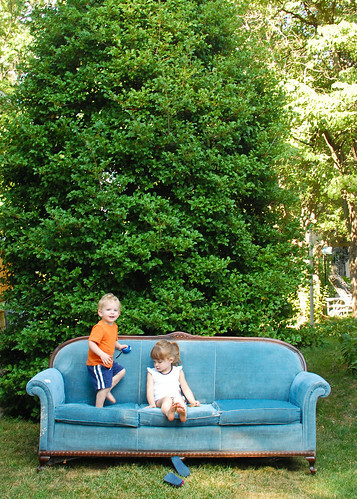 I have wanted an old blue velvet couch for as long as I can remember. Granted, it’s really not in great shape. The fabric is threadbare in spots and the piping is poking out of cushions. Later in the evening, it took a good shopvac to get it cleaned up a bit. But, it’s still just so pretty. And it has great bones. 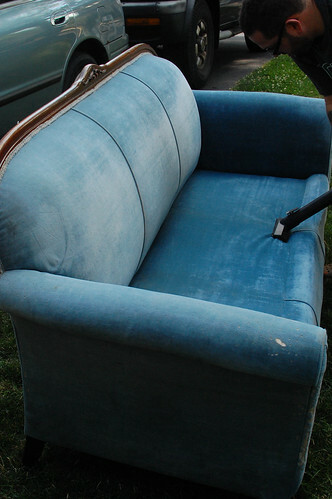 I’m getting all crazy envisioning re-upholstering it the same exact shade of blue velvet. The cushions are also in need of help in a big way. But I don’t care. It’s beautiful. And free. Even if my husband just wants to put it right back out on the curb. Years ago, A blue (in this very same shade) velvet couch was the first thing that my husband and I bought for our first new home. So many memories are flooding back. Congrats on your find! Also like the pictures, especially the first one looks like from a movie or something. What a fabulous find! Looks in really good shape to me…definitely lovely bones. Have fun with it! I have a John too…(shakes head)…they should be so lucky to have women with vision! Wonderful find…hoping to find time to read more of your posts!!!!! About 2 months ago I came across this couch’s twin soul in Harvard Square Cambridge. It was on a side street just behind the Coop. 6 feet long on the inside and red velvet. A deep beautiful red with solid wood scroll work and the cushions were PERFECT!!! The scroll work was more elaborate than this blue one with animal figures carved in by hand. I laid there on it on the street for about 30 minutes praying for some cosmic conveyance to come take the couch with me to some far away place where we could meld more thoroughly but alas, none came…maybe I should have waited awhile longer. But I had no place to put the thing and no way to move it so I walked over to “the pit” (the area around the Harvard Square T stop where the homeless kids hang out and told one I knew about the couch. 5 minutes later it was proudly positioned outside the T stop with all three perfect cushions occupied royally. But several hours later it was gone. I never found out where it went but perhaps it was itself “the” cosmic conveyance I had prayed for outside of linear time. If only I’d had more faith! But I can’t help imagining it sitting across from your blue beauty in some distance place occupied by interesting people talking about interesting things…. awesome find! and it is so pretty! 🙂 glad you found it. You and I would get one very well. I love it too. My boyfriend just grans when I see a throwaway. Our house is stuffed ful of 2nd hand white painted furniture mixed with comtemporary classics and a french wrought iron dining table. The old leather chesterfields are the hide equivelent of threadbare but I love them. Why would anyone go and buy some horrid thing from Ikea that won’t last the first move when you cann get great things like this that are worth recovering. Good on you. Tell your hubby that he just cann’t see the full picture and to trust you. Make sure you smile and have one of his favoutires beverages in your hand! He’ll come roundd sooner or later. Mine always does! I think it’s a marvellous find. I love the structure of it, and the blue makes it even more special. Absolutely gorgeous, I’d love to photograph with something like that. Such a lucky find, and I bet it’s soft and comfy! Looooove it! Congrats on your find. Even if it is threadbare, as you said, it has good bones. You can do so much with a quality piece. Enjoy! So cool that you got this for free! I love the color and the shape. Right out of some Jane Austen novel 🙂 I’d like to see how it looks when you restored it to its old glory! 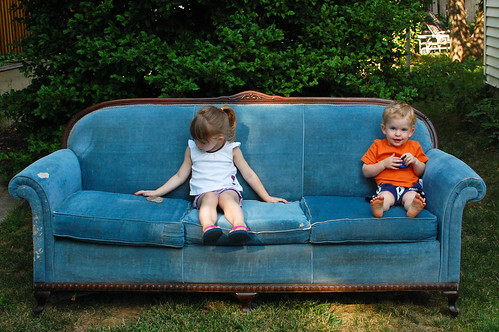 You are so lucky, I’m guessing he (your hubby) wasn’t born with the “vision” …lol..
.love love the sofa..I have a sofa from the 40’s original material was the scritchy stuff, I’ve had it recovered 6 times and hope to never part from it. Gorgeous! Jealous I didn’t find any of those beauties in my neighbourhood! I think it is gorgeous! From far away it actually doesn’t look that bad.